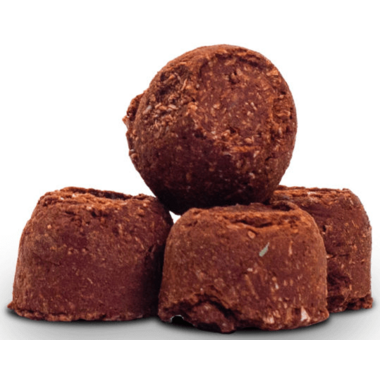 Enjoy the exceptional taste of our dark cacao macaroons, without any guilt! These decadent cacao macaroons will seduce your taste buds. Their gluten-free macaroons are made with 100% organic cacao powder, organic coconut and sweetened exclusively with organic maple syrup. Ingredients: RAW ORGANIC CACAO POWDER, ORGANIC COCONUT, ORGANIC MAPLE SYRUP, ORGANIC VANILLA EXTRACT, HIMALAYAN SALT. Delicious! 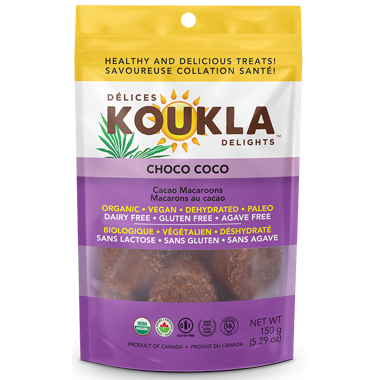 I first discovered this product in a Little Life Box box and was pleased to find it on well.ca I greatly recommand those yummy bites. Kouklas are a staple in our home. Itâ€™s our healthy go to when weâ€™re craving a little something sweet. Theyâ€™re delicious and guilt free! 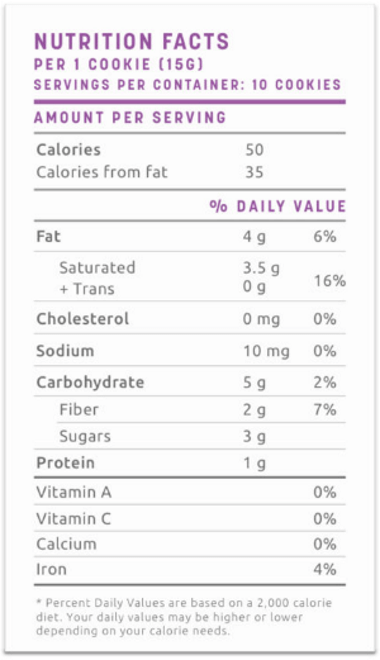 Delicious, satisfies a craving for something sweet without the sugar â€œhangoverâ€�. These are my favorite guilt free sweet snack!! They are so delicious! Really good! Low on sugar, filling after 2. Goes perfectly with a morning coffee. Low on sugar, full of taste and filling! I highly recommend those, the only drawback - with quality ingrÃ©dients comes a higher price. One of my most favourite snacks. Filling, delicious and most importantly vegan. A little pricey but they are worth it. Love this product and the natural ingredients in it. I always look for these when they come on sale because they are expensive but so so yummy! One of the only treats I allow myself that does not flare up my psoriasis ..
Soooo good and healthy ingredients. Excellent product! Delicious, good for you and made with quality ingredients. Two thumbs up!!! I follow a LCHF diet. I love these for a low sugar treat! I will be buying again. The choco coco are the best when you want a guilt free treat! These clean sugar-free treats rock. Super tasty and they don't fall apart like many other energy balls. Not icky sugar substitutes either. Highly recommended! Adore these! I love dark chocolate so these are perfect. The macaroons are not too sweet but definitely satisfying. Super clean ingredients too. I really enjoyed these. Great chocolate, just as I hoped! Unfortunately, maybe my expectations for this product were too high. It taste nothing like the macaroon you buy at the store. Strong cacao flavor, not sweet at all. Some may like it fore sure but for me its just not something I like.